An important aspect of an emergency management plan is the development and provision of key information and actions to be undertaken in an emergency. 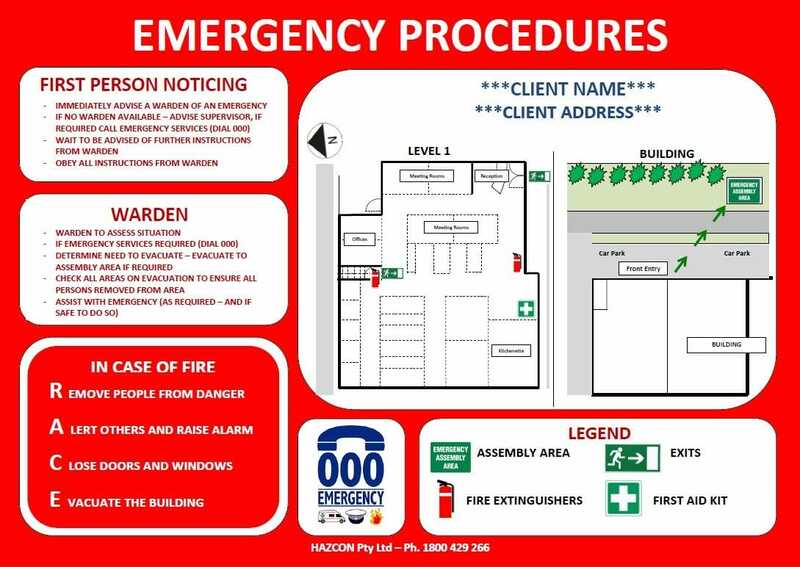 HAZCON can assist your organisation to develop emergency evacuation diagrams that meet the requirements of AS 3745 - Planning for emergencies in facilities and assist in complying with health and safety obligations. These diagrams are produced and customised for your needs and are site / building specific. Emergency evacuation diagrams provide employees (and other persons at a workplace - contractors, visitors or the public) with clear and visible guidance on what to do in an emergency. The development of these diagrams may lead to less confusion, direct and appropriate response, less potential for physical and emotional impacts on people involved in an emergency and reduced direct impacts on the business. Detailed and effective emergency evacuation diagrams should be included as part of any organisation's health and safety management systems and emergency management. These diagrams, once developed and displayed in a number of prominent locations throughout a workplace, provide a significant means and method to provide key information and instructions before and when an emergency occurs.